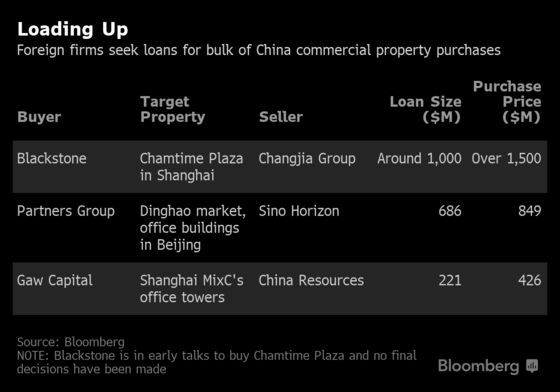 (Bloomberg) -- A flurry of private equity funds buying commercial property in China is reviving syndicated loan volumes in the region. Firms including Blackstone Group LP and GAW Capital Advisors are in talks with banks in Asia for loan deals of more than $2 billion so far this year to buy office towers mainly in Beijing and Shanghai. The pipeline of such deals is expected to grow, which will help broaden financing opportunities for lenders, according to Standard Chartered Plc. Overseas firms purchased a record $9 billion of commercial property in China last year. "We expect loan demand from recent foreign private equity firms’ acquisition activity in the real estate sector in East Asia to continue, given that numerous sponsors have or are raising sizable real estate and infrastructure funds," said Lyndon Hsu, global head of leveraged & structured solutions at Standard Chartered in Singapore. Commercial property investment in China by foreign firms surged 62 percent to 78 billion yuan ($11.6 billion) in 2018, the largest amount in data dating back to 2005, according to CBRE Group Inc. In contrast, China’s acquisition-related syndicated loan volumes slumped about 34 percent to $16.6 billion last year amid lackluster economic growth and tight capital control in the country. Loans for property purchases by top-tier financial sponsors, often partly backed by prime commercial buildings, are viewed as less risky for banks because they are less sensitive to a property downturn, unlike home prices. In November, Singaporean developer CapitaLand Ltd. and sovereign wealth fund GIC Ltd. splashed out 12.8 billion yuan to buy Shanghai’s tallest twin towers in the biggest commercial property purchase of 2018. One caveat for such lending is some of these borrowers often push for higher amount of loans relative to the value of the underlying property. This means less buffer for banks to absorb price volatility. "The leverage ratio on those loans has generally become quite aggressive," said Yuanyuan Fan, managing director of mergers and acquisitions finance at China Merchants Bank Co. in Shenzhen. "Lenders will have to negotiate for tighter loan clauses to lower risks."